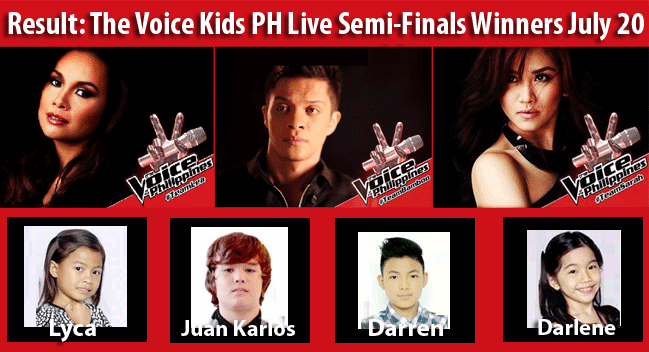 The much awaited results of The Voice Kids live semi-finals is here. The six talented young artists performed on the stage to show that they are capable of surviving the competition up to the finals. Six of them have competed and there is only a need to know who among them will remain and advance to the finals. Now, after a through deliberation and tabulation of number of text messages saving each young artist, the results are here. The four who will be competing again next week for the finals will undergo training once again to their coaches. Congratulations to the four kids who will made it. They are truly amazing how they improved from the start of the training, or earlier during the blind audition..
Congratulations to The Voice Kids Top 4: Lyca, Darren, Juan Karlos, and Darlene! Watch the Summary of Semi-Finals of The Voice Kids Philippines July 19, 2014 with hashtag #TVKSemiFinals here.